Claire Reid attempted to grow her own vegetables in her parent’s small urban garden. Frustrated that she had to buy such a large amount of seed and fertiliser to be able to plant the small area she needed coupled with the difficulty of getting the seeds to stay in the ground at the correct depth and distance apart she asked her families domestic worker Maggie to help her with this difficult task. When Maggie struggled to understand the instructions on the seed packet Claire realised the true extent of the difficulties many South Africans who need to plant vegetables to feed their family face. Claire therefore invented a pre fertilised, pre spaced organic seed tape in response to this need. As she began to refine the design of the product she became very aware of the amount of water that traditional planting wastes. She was able to scientifically prove Reel Gardening's ability to reduce water consumption during the germination period of vegetables by 80%, this aspect of the Patented Invention lead to it winning the international Stockholm Junior Water prize in 2003. Claire was able to secure a loan in 2009 which enabled the commercial production of Reel Gardening to begin in early 2010. There was immense pressure on Claire to commercially manufacture the product on a mechanically driven machine which needed to be largely imported from Italy. Claire stuck to her dream for her product to be made in an environmentally friendly manner while creating as much employment as possible. Reid therefore designed a simple hand operated 'machine' to make reel gardening. Reel Gardening employs previously unemployed mothers to hand make the product in a process that uses no electricity and produces zero emissions. Reel Gardening is manufactured using vegetable based inks, organic fertiliser as well as open pollinated seeds. All these attributes result in positive contributions to the soil it is planted in and the environment as a whole. Reel Gardening encourages people to grow their own fresh produce at home which negates the need for transport as well as the need for refrigeration. Reel Gardening is a simple, easy to understand product that can be used by anyone despite age, education or location. Reel Gardening has gone one step further by developing a garden in a box model that has been successfully implemented in local and rural communities across South Africa. Reel Gardening emphasises the need for environmental education in the schools it implements gardens in and therefore undertakes to educated the learners and the teachers on soil care, organic pest prevention through companion planting, encouraging natural biodiversity through composting, watering, plant protection and reduction in burning of rubbish and promotion of recycling. Reel Gardening has witnessed an increase in awareness and appreciation of the soil and surrounds in many of the schools and communities it has been involved in. 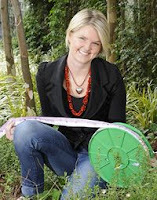 Reel Gardening is a proudly South African invention that has changed the way people approach food gardening. We believe that we are starting a planting revolution.